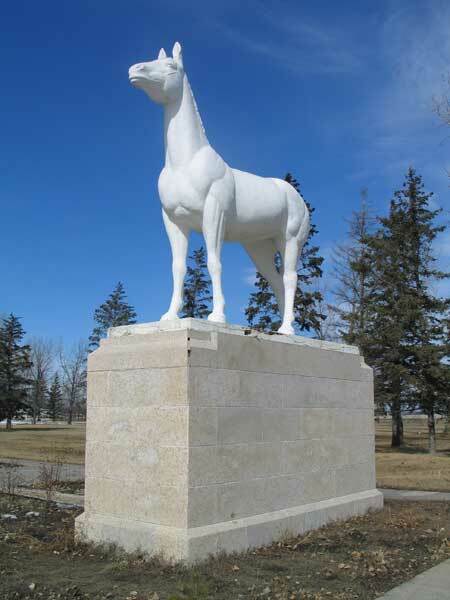 This statue in the Rural Municipality of St. Francois Xavier, created by Winnipeg sculptor George Barone, commemorates an Aboriginal legend that is described in the article below. It was erected by the Manitoba Tourist Association, with financial support of the White Horse Distillers Limited of Glasgow, Scotland and unveiled on 10 September 1966. 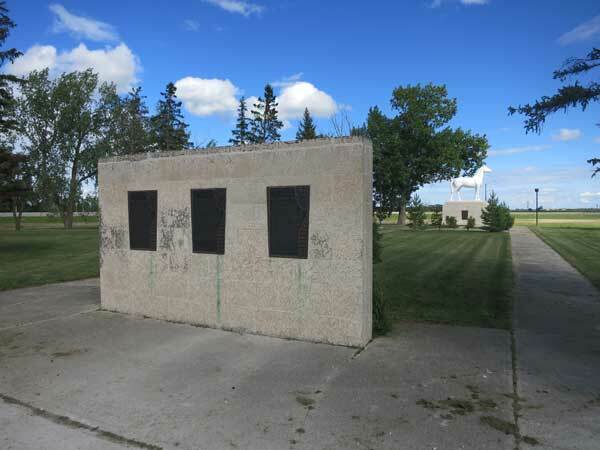 Nearby are three plaques, erected in 1966 by the Historic Sites Advisory Board of Manitoba, that provide information on the Fort Ellice Trail, White Horse Plain, and the Assiniboine River. The Fort Ellice Trail, also known as the Carlton Trail or Saskatchewan Trail or Edmonton Trail, led across the western plans from Upper Fort Garry to Fort Edmonton (in what is now Alberta). A distance of more than 900 miles (1500 kilometers), the route was used by First Nations, fur traders, explorers, missionaries, surveyors, and settlers. The Assiniboine River, chief tributary of the Red River which it joins in the City of Winnipeg, takes its name from the Assiniboine Indians through whose hunting grounds it flowed. The river rises in the province of Saskatchewan and is approximately 600 miles (1000 kilometers) in length. A number of trading posts were established along its banks by the North West Company, XY Company, and Hudson’s Bay Company. On its waters plied canoes, York boats, and steamboats. The first post along its banks was built in 1738 by La Verendrye who called it the St. Charles River. Manitoba Pageant, Volume 14, Number 3, Spring 1969.